The construction of offshore wind farms has become a routine activity, but it still takes too long. In order to save time it is necessary to define technically feasible limits for the individual stages of the process. ith the wind turbine installa­tion vessel (WTIV) a com­pletely new class of ship has emerged in recent years, consisting of a flat rectangular hull with an extensive load area and a large crane. Propulsion and exact positioning are achieved using electrically driven ­rudder-propellers (thrusters) or Voith-Schneider propellers. The requirement for fuel and electricity is high because the bulky hull has to be moved through the water at a speed of 10 to 12 knots until the construction site has been reached. Once it is there, the working position must be actively maintained until the jack-up legs of the ship stand firmly on the seabed. Multiple diesel generators in the hull supply the four to eight drive motors with suffi­cient electricity. Four or six jack-up legs provide a secure stance on the seabed – even in high waves. Multi-storey superstructures on the bow, usually topped by a helicopter landing platform, provide accommodation for the personnel­. Before this type of ship evolved, the offshore wind industry first gathered experience with crane ships ­borrowed from the oil and gas industry, where they are still in use. Ten years ago there were only a few ships that were suitable for the installation of wind turbines at sea. Two of these veterans are still active: the Sea Power, which was constructed for A2Sea by converting a small freighter, and the MPI Resolution, which is regarded as the very first WTIV because she was constructed for this purpose right from the start. After the MPI Resolution went into service in 2003, it took a long time before further ships followed. More and more wind farms were constructed but the volume of the contracts was so small that no investor dared to commission such an expensive and extremely ­specialized ship. The wind farm planners had to ­improvise by chartering ships that were temporarily not needed by the oil and gas industry and were therefore ­affordable. From 2009 onward the situation became easier. Numerous ships were commissioned and in the six years from 2009 to 2014 a total of 25 WTIVs went into service – with a high point in the year 2012 when seven ships were available for operations for the first time. Although the fleet of WTIVs is already quite big, shortages cannot be avoided. When this happens, heavy-lift crane vessels (HLCVs) are put to use. Some of them were originally built for a completely different purpose and have a specification that is somewhat different. Nevertheless, they are well suited to the construction of offshore wind turbines. An outstanding example is the Svanen, which was originally designed for the construction of a large bridge and can lift a load of 8,700 t. She is clearly over-dimensioned for the erection of wind turbines but is cheap to charter because she hardly gets any other work. The Thialf, with its 12,000 t crane capacity is one of the world’s largest crane ships and is used only seldom in offshore wind farms due to the high costs. The installation of offshore wind farms is a job for specialists. In the euphoria of the pioneer phase, when the expansion targets were even higher than today, several outsiders convinced themselves to build ships in order to participate in the supposedly lucrative logistics business. The market activity has calmed down a lot since then and of the 30 WTIVs listed in the table, 25 are owned by eight shipping companies. The outsiders have largely thrown in the towel. The German building company Hochtief, which founded the joint-venture HGO Infrasea Solutions t­ogether with GeoSea, has completely withdrawn from the offshore business. A year ago Hochtief sold its share in the Innovation to GeoSea and in September 2015 the Vidar was sold to the Jan De Nul Group. RWE Innogy, a subsidiary of the German energy conglomerate RWE, which had two construction ships built around four years ago in order to put up its own wind farms, has sold the Victoria Mathias to MPI ­Offshore (the ship is now called MPI Enterprise) and has chartered the Friedrich Ernestine to A2Sea. The ­latter has been renamed M/V Torben and is now in Taiwan erecting the country’s first two offshore wind turbines. RWE Innogy continues to be active as a project developer but will leave the installation to the specialists in future. The third outsider that had a WTIV built was the company Bard Offshore, which with the highly risky ambition to do everything itself – from the construction of its own wind turbine and foundation structure to the installation of wind farms – failed within a few years. 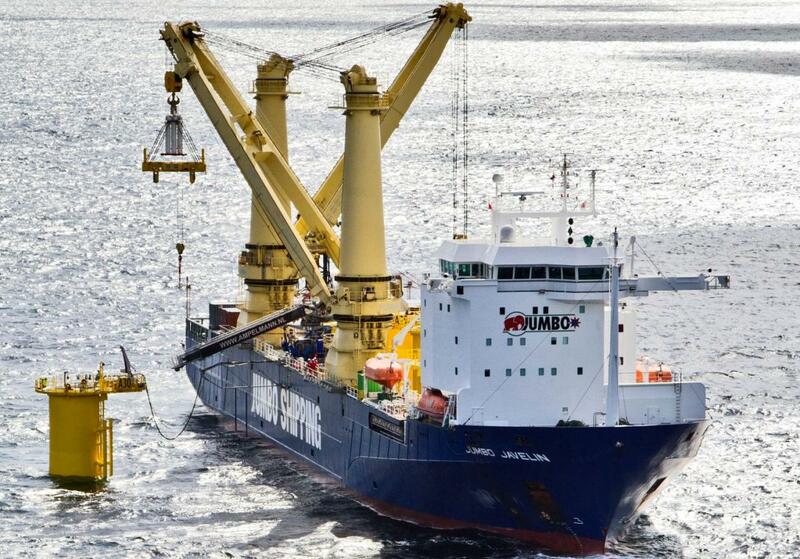 The company went bankrupt some years ago and their construction ship Wind Lift 1 is now chartered out by the small German shipping company Wulf ­hSeetransporte. With this consolidation caused by economic factors the technical pioneer phase of the offshore installation ships also seems to have come to an end. The WTIVs have been developed to an advanced stage and the construction of wind farms has become a routine process. Now a phase of cost reduction has begun and the first voices are loudly defining targets whereby construction can go faster and more smoothly, and money thus can be saved. There was a limit to the demands that could be placed on the ships of the pioneer phase. For the second-­generation ships there is no such honeymoon period. They were very expensive and must earn their money. “There have been plenty of expectations around second-generation vessels”, reports Søren Grøn, Project Manager at the pioneer company A2Sea, and poses the question as to whether these highly specialized ships will come up to expectations. Dynamic positioning (DP) is divided into classes according to ability. It is decisive for the operation of the WTIV and concerns the exactness of the positioning of the ship and the redundancy of the electricity and drive aggregates. Class DP1 includes all ships which are no longer able to maintain an exact position when a drive system fails but are still able to manoeuvre. In an emergency they are thus able to return to port under their own power. Ships with DP2 are equipped with a double set of drive generators and position calculators. They are therefore still able to work when one system fails. However, the systems have a joint electricity supply and need to be adjusted when one system breaks down. A higher level of redundancy is achieved in class DP3 through the doubling of the electricity supply. Separate machine rooms and emergency power supplies reduce the risk of a system breakdown to a minimum. Vessels without DP include older jack-up barges without their own drive systems and ships with conventional hulls. These vessels are held in position using tugs with DP abilities, or otherwise need to be anchored. Around 15 years ago, the Danish shipping company A2Sea became the first to exclusively specialize in the construction of offshore wind farms. Initially, the company used converted freighters and jack-up barges but at the end of 2012 it put the Sea Installer into service and two years later the Sea Challenger. Both ships can transport eight complete 3.6 MW Siemens wind turbines and can work faster, safer and more cheaply than their predecessors. Their performance is measured according to a mantra that A2Sea itself has formulated. “During the design phase, the 24/12/24/12 mantra functioned as a springboard for creating innovative approaches to installation methodologies”, says Grøn. What do these four figures mean? The new ships should be able to dock, load their freight and set off back to sea within 24 hours. They should not need more than 12 hours to jack up at the working point at sea, install the wind turbine and move to the next position – in other words they should be able to work to the rhythm of the tides. Thirdly, it should be possible to perform the processes to put a wind turbine into operation within 24 hours. The fourth figure does not refer to a time period but to the wind speed: it should be possible to mount the rotor blades at sea in a wind of 12 m/s. The first of these requirements has proved to be relatively easy to fulfil if the port traffic allows for punctual departures. The loading of eight nacelles, eight towers and 24 rotor blades takes significantly less than 24 hours according to A2Sea. How long it then takes until the ship can start working at sea is, however, dependent on harbour restrictions and not on the performance ­capability of the ship. Installation and transfer to the next point within 12 hours is possible in theory – but not always in ­practice, admits Grøn. At the wind farm West of Duddon Sands the Sea Installer needed between 12 and 15 hours, whereby jacking up and down and moving to the next point usually required more time than the installation itself, which was normally completed within six hours. A2Sea has no influence on the process of putting the wind turbine into operation, only on accommodating the installers as comfortable as possible on the ship. When they completed the processes within 24 hours, it was probably due to them feeling comfortable on the Sea Installer, says Grøn with a wink of the eye. The fourth figure represents a high hurdle. 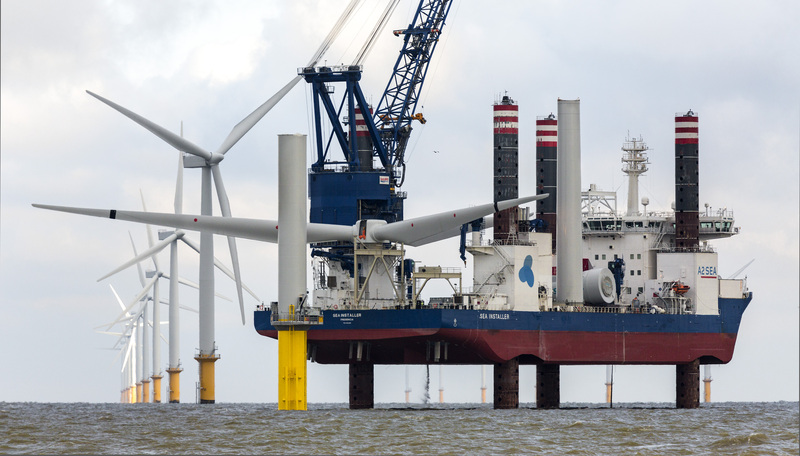 The relatively strong wind of 12 m/s defined by the mantra has not yet been achieved by A2Sea: “Even with Sea ­Installer, blades are still being lifted in not much more than 9 m/s”, admits Grøn. In the case of the wind speed, the definition of the mantra seems to be somewhat arbitrary, as if the aim was to define all the important parameters using the numbers 12 and 24. The company’s competitors are not quite so ambitious. Ben Robinson, Major Projects & Operations Manager at MPI Offshore calculates with an average of 36 hours for dock, load and sail (when six wind turbines are to be transported) and with 24 hours for the erection of each turbine. MPI Offshore has set a wind speed limit of 10 m/s for the installation of rotor blades, thereby coming slightly nearer to the limit set by A2Sea than the company itself. The other shipping companies are keeping quiet about such things. Which targets will be achievable in the end without increasing the risks during installation has yet to be seen. But the discussion about the reduction of costs will be an ongoing theme in the industry over the coming years, and it will therefore be unavoidable that targets for the installation of wind turbines are set towards which everyone must be orientated.